Affray, tunnels that really weren’t, llamas that really were, and rare “selfies” that ought never to have been #narrowboat #England – The Diesel-Electric Elephant Company. The bright lights and attractions of Gnosall can only hold a chap in thrall for so long, so so long, Gnosall, and thanks for the memories. Speaking of memories, there was Sunday morning for one. The Cardinal was moored up just back from the Gnosall water-point (quite legitimately and politely, but also cunningly within long hosepipe distance). Two boats were moored on the water-point, had been for some time and looked as though they intended to stay until Spring – mooring on a water-point (and thus denying others use of it) is a hanging offence on the canals, although not enough folk are hanged for it to my mind, too many get away. Well, the morning being dull, grey and apparently free from madding crowds, I thought that I would take the opportunity to top off the tank, the better to make a swift exit when the mood came upon me. No sooner had I stepped off the boat, hose-pipe reel in hand, than all merry hell broke loose. The chap on the red boat popped his head up (the rest of his body was with it, it wasn’t on a stick or anything), the woman on the next boat along nonchalantly stepped off and walked away with the obvious intent of emptying her dog somewhere more private, the chap on the third boat stirred his stumps and a be-boated couple arrived (cruising “towards” us in this photograph above)… wanting water. Caught like a rabbit in headlights I said my ‘ooh-arrs’ and my ‘shiver one’s timbers’ to those that I couldn’t avoid, hooked up the hosepipe to the nearest tap and attempted to retire (to retire into a sullen state of withdrawal, the better to iron my collection of “Did I really look like a people person to you?” t-shirts). The visiting boat wanting water made a clump-clattery point of trying to moor sixty feet of narrowboat in the twenty feet of gap between the two boats illicitly living on the water-point, and then, defeated, hopped along, around the Cardinal and moored up behind us… so that they could decant themselves on the towpath and walk back for a good old argument and wotnot. The red boat then decided that he would move after all, and promptly and somewhat grudgingly, edged up closer to the boat in front, meaning that the visiting boat then had forty feet instead of twenty feet into which to fit a sixty foot boat. The visiting boat then announced that they were “quite likely to ram” the stern-gear of the red boat, and proceeded to try to do so, all while in reverse themselves. The dog-emptier returned, and her … gentleman associate … who had been aboard but not answering calls, came out to meet her. Discussions warmed up, both illicitly-moored boats decided to move, the Cardinal announced to me that his tank was full so I disconnected the hose and the visiting boat decided not to ram anyone but to stay where they then were and to use the tap that I had just finished with. I began rolling up my long hose back onto its reel, the better to retreat again to the “visitor” moorings where the Cardinal was quite legitimately moored. Having long since taken an oath to let the world do whatever it is that the world does, while I keep my counsel, keep my distance and keep a wary eye, I suddenly thus found myself flung from “a quick, quiet, refill” into unwitting, unwanted interaction with (what is supposed to be, but I refute the evidence) “my species”. Plan B-272a was put into effect. Plan B-272a, in these circumstances, requires me to “freeze” my body-language, be polite to everyone, idiot or otherwise, and to always have something else quite fascinating and urgent, elsewhere, that needs doing. To wit, I left them all as best I could to get on with it. I retired swiftly indoors once more and shot the bolts. Yes, those pillocks should not have moored on the service moorings, but they were, and their type always will, nothing that I can say or do will ever make them more considerate, so why bother? Been there, done that, can’t be bothered trying any more. I sympathised with the visiting boat wanting water, I empathised with them, they were indeed wholly “in the right”, but being in the right doesn’t make banging your head against the dull rock of the human idiot any less painful or any more worthwhile. Had I been the “visiting” boat and in dire need of water then I would have said nothing but simply breasted up to the second boat along (the dog-emptier boat) and trailed my hose over their deck… and any objection from them would be duly noted on the ship’s log (which reminds me, I must put a fresh roll out). Anyway, that was my peaceful Sunday morning, full of people arguing. Note to self – improve your timing, Hutson. Just because a place is deserted it doesn’t follow that it will still be so after ten or fifteen seconds have passed. Monday also dawned dull, grey and relatively wind-free, so the Cardinal and I mooched. We did another 5.38 miles, roughly two hours at my preferred cruising speed in leaf-soup. First to be tackled was the impressively-named “Cowley Tunnel”. Well, I suppose that it is a tunnel, technically, but it’s only four boat-lengths long at 81 yards and nothing like the 1.5 mile [2.4 kilometre] beastie that awaits me ahead. Cowley was supposed to be 690 yards when built but the roof kept falling in, and 81 yards was all that would stand. I think it may be because of a fundamental lack of understanding of “the arch”, from the looks of it, but what would I know eh? Cowley Tunnel. Intended to be 690 yards, but of the roof only this 81 yards declined to keep caving in. The Victorian civil engineers took a quill and scratched out “tunnel” on the plans, substituting “cutting” instead. It is a dinky little thing really, you can see right through it. We’ve been under bridges almost as long. Thank you to the remaining bit for not collapsing while we cruised through, twas much appreciated. It was then that “selfie” madness overtook me. I warn you now, before you scroll down, that I have a face entirely suited to appearances on the wireless. Some folk are blessed with the faces of angels, but when I was being carved out I think that the angel may well have been bending over, and I was modelled rather on the other end… Do try not to laugh, this is the only face that I have. Mr Bug Smarstard. The day was so dull that Mr Camera’s flash went off with virtually every photograph. Personally, I am both surprised and impressed that the camera still works after this. Japanese technology is not to be sniffed at. Didn’t see a single other boat moving, until we got to the far end of our moochings and were looking for moorings. The canal was ours. Another camel through another eye of a proverbial needle. One of these days I’ll read the guide and the canal ahead will be described as “wide, with plenty of depth of water, and with the whole towpath suitable for mooring”, but Beelzebub will be breaking out his Duffle Coat and muttering about “ice ages” before then. This stretch too was “narrow &etc &etc”, and parts of it indeed were. Too much going on here to appreciate the llamas. The llamas were between the tree and the bridge, up a steep bank to the right, and I confess that I was too busy a., being surprised and b., steering to be able to take a photograph. Anyway, a mile or two farther on we found what I was looking for – something with a wider horizon than Gnosall, something with a bit of countryside to be seen from the windows, something with less… affray. Even in grey drizzle England can sooth and inspire. Even in grey drizzle England is remarkable. 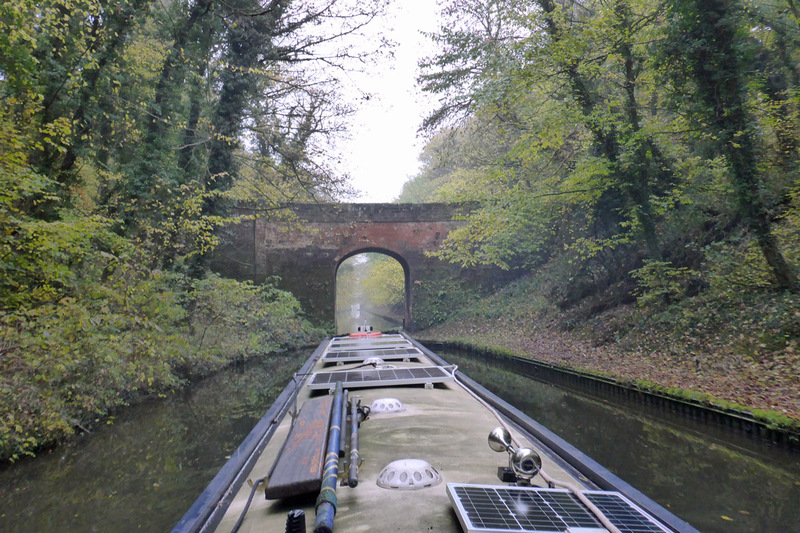 The moorings that we are on currently don’t have quite the vistas of the journey, but they are more open than those of Gnosall, and there’s less chance of my solar panels starving to death here (no overhanging trees). Admittedly, we are in the town of Stepford with all of the weirdness that this implies, but it’ll do for a day or two. The sign-posts read as “Wheaton Aston” but I’m sure that it is really Stepford. The guide book says “over-run with new housing”, and they aren’t kidding. “Over-run” is an understatement, I have never been in a town that is so claustrophobic, they’ll be building ticky-tacky boxes on the roads next. Still, like the affray of Gnosall, that is not my concern, for I am through town, and moored on the canal (where, with tongue in cheek, we all live cheek by jowl in steel tubes). The church in Wheaton Aston is quite nice. It’s set in the largest remaining “open” space in the whole town, and the wide-angle of my camera just caught the edges from as far back as I could get. The church has been there since about the year 2. Certainly since before the planning authorities lost the plot, anyway. The church in Wheaton Aston. There since the year 2, it is now surrounded, breathlessly closely, by the most awfully intensive display of ticky-tacky. Perhaps the town is an experiment that the government is running, to plan for housing conditions in twenty years or so, when we have bred ourselves into “standing room only”? So, there you have it – there you have them, my two yesterdays. A to-do at the water-point, a tunnel that would rather be a cutting, and llamas abounding, all followed by a town that gave me the willies, worrying whether I’d have room to breathe as I edged through, sideways. There’s wind forecast for the next few days, so we may well be enstuckinated here for the duration, but it’s not all such good news. There is another service point just a waddle up ahead, and my solar panels are happier than ever they were in the dingly dells of Gnosall. The cherry on the cake is a spot of interwebnettings signal, just a spot, but enough. Pasta for tiffin, methinks. I shall break a fresh jar of olives out from ship’s stores. Your accounts of your days make me smile, a gift on a windy, wet day when the lake is full of waves that we can hear breaking on the breakwater… Thanks! It’s a lovely face, nuff said! Crikey, it all goes on aroung you! I like the look of your face, it is non-confrontational, very reassuring. Have a good week m’dear.